Now that we are well into our first month of the new year maybe you have been bitten by the “Time to Redecorate” bug. 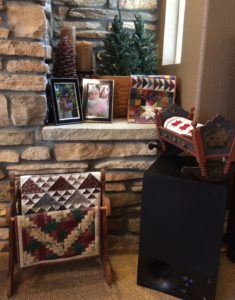 It’s good to freshen up around the house and I thought I would share just a few ideas that I have used at home to display some little quilts. 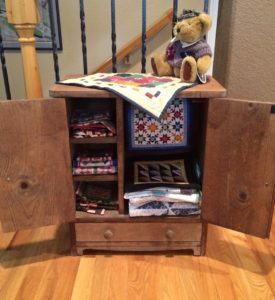 I not only love little quilt racks but I like to drape quilts over baskets, onto doll beds or onto most anywhere that looks like it needs a splash of color or design. 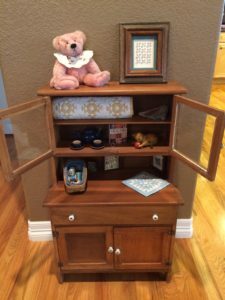 I have been fortunate enough to find a few pieces of antique children’s furniture (like the little hutch to your left) and I just love to fill them with antique toys, quilts, tea sets or whatever seems to fit the season. The one to your right holds ONLY little quilts, although I let the Grandpa bear sit on the top – just to add a little character and wisdom. I would love to have many more of these but I seem to be running out of wall and floor space. Of course, that doesn’t stop me from still loving to antique shop. You never know when there might be another little doll quilt or piece of furniture. 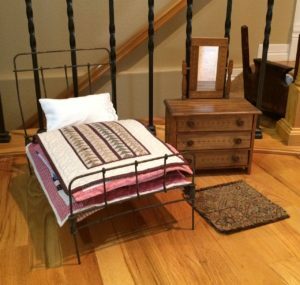 This little iron doll bed is a great place to stack my super little miniature doll quilts. It also makes it easy to have a bed turning when girlfriends come over for a cup of tea. We can easily look at 20+ quilts in a very short time. 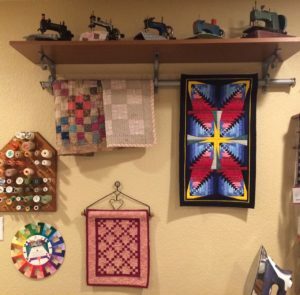 In my quilt studio, I keep several quilts hanging underneath the rack holding antique sewing machines. I think i t is good to keep inspiration as nearby as possible. And it is fun to rotate these with the season (or with new antique purchases). This last one is near my front door. 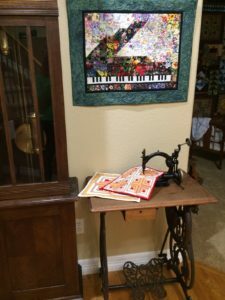 Who doesn’t want a sewing machine and quilts to welcome their guests as the grandfather clock next to it chimes the hour? I hope I have inspired you to look around and see where you can put your last little creation or purchase. I believe you can never have enough quilts on display in your home. ← The ABC’s of 2017!